This is one of the coolest maps that floats around on the internet. It get re-tweeted and shared regularly. It shows the parts of Ireland and the UK that pronounce scone to rhyme with “cone” and those that pronounce it to rhyme like “gone” (the poor deluded fools). IMHO this has to be the pinnacle of the internet. But it rarely gets a citation for where it came from. 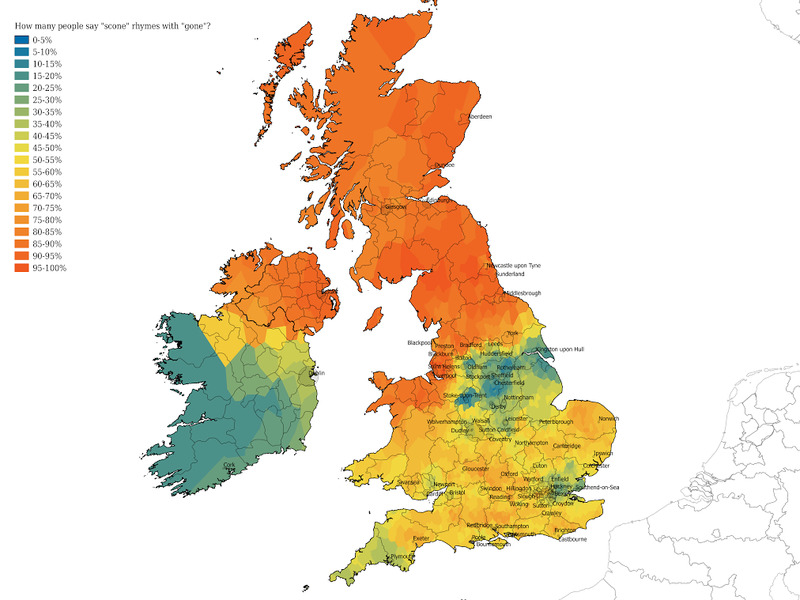 I discovered that it is from a University of Cambridge study on the decline of regional dialects. There are a few interesting things in there including – like differences in pronouncing the “r” in “arm” exactly correspond to the Scottish-English border. The researchers reckon they can place where you are in the UK to within 35 miles based on how you pronounce certain words. For me the main use of the excellent “scone” map is to identify where to prioritise the location of the compulsory re-education camps for when I come to power. Together we will end the use use of the blasphemous “gone” pronunciation.